Thane is an amazing city that offers all that you need for beautiful living every day. As it continues to grow at a fast pace, plenty of people have their eyes on this city today. 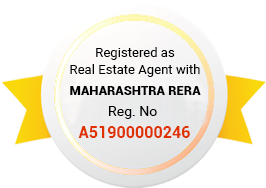 The real estate market in Thane has magnified gracefully, providing various options in terms of residential as well as commercial projects. Acme Ozone is a new mini-township residential development by Acme Group that offers a life of endless luxury, comfort and a heavenly atmosphere. Extended across 14 acres of luscious land, this development contains 11 high-rise towers (G +27) that are vibrant and beautifully crafted. Offering 2BHK, 3BHK, and 4BHK luxury apartments of different configurations with large apartment areas that you will never run short of and that is for sure. 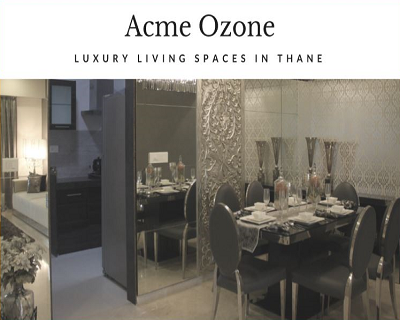 Acme Ozone Thane is a mini-township development that is packed with exclusive amenities for a modern-day lifestyle that you and your family truly deserve. With a variety of internal and external amenities, experience wholesome goodness no matter where you go. The apartments are spacious and contain luxury furnishings and fittings, high-quality vitrified flooring, master bedroom with laminated wooden flooring, veneer-style laminated doors, beautiful French windows and balconies providing a panoramic view of Yeoor Hills that will satisfy your senses, premium electrical ports with modular switches, glazed tiles in washrooms, gorgeous kitchens with granite counters, non-toxic paint, safety features and the list just goes on. The external amenities at this fabulous mini-township are totally spectacular and will always keep you relaxed, entertained, joyful and at peace every day. They include a massive clubhouse, gymnasium, swimming pool, jacuzzi, sauna, jogging track, acupressure pathway, yoga and aerobics room, dedicated area for senior citizens, multiple sports facilities and a play-area for your kids, day crèche area, astronomy deck, café, juice centre, salon, newspaper reading and laundry area, library, party zone, guest rooms, multipurpose hall, mini-theatre, business lounge with Wi-Fi connectivity, efficient car parking, swift elevators and 4-Tier security with video surveillance. This is something new to do at this premium development all the time and there is no doubt about that. 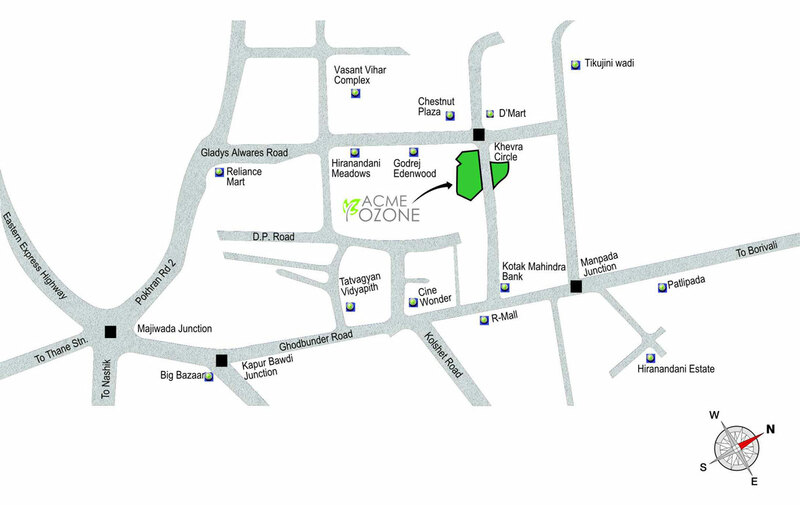 Located at off Ghodbunder Road & Pokhran Road No. 2 in Thane West, this development comes in close proximity to a number of places that you may need to access every day or during emergencies. Places like schools, colleges, medical centres, hospitals, convenience stores, supermarkets, malls, shopping centres, restaurants, cinemas, banks, ATMs, highways, public transport and a lot more can be accessed within minutes and without traveling long distances. The Acme Ozone price is low and totally affordable. It goes without saying that the complete package of a rejuvenating lifestyle comes at a cost that is truly worth your savings. Choose from a number of payment plans according to what suits you, while you can also take-up home loan facilities through associated banks. 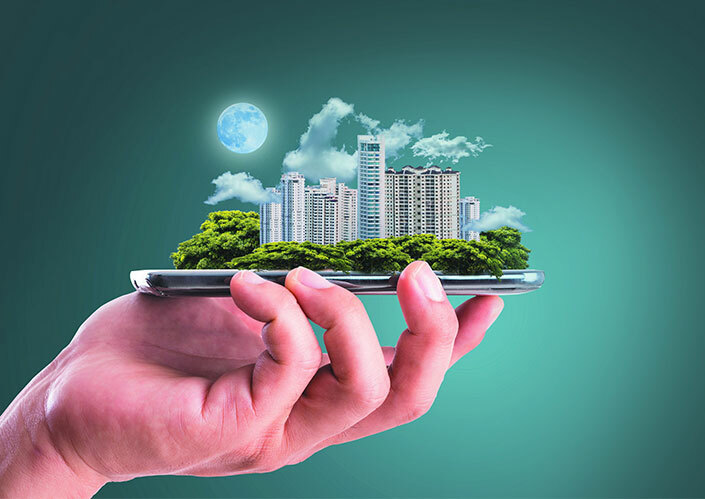 You can now purchase a Property in Thane without worrying about a load on your wallet! Cosmos lounge, Thane West, Thane.